I cannot believe that I actually managed to create my first piece of block ASCII Art in ages… eons might be the better word to describe the time frame between the creation of this ASCII?? and the last ASCII of mine that I created before this one. 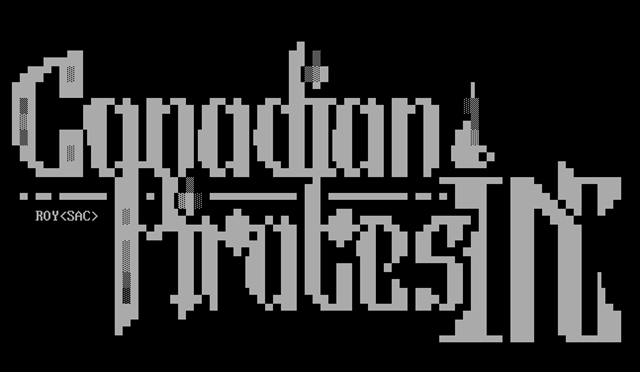 The ASCII that I created was a long over-due request by Mad Max, the co-founder of the old scene group CPI, Canadian Pirates Inc., which I actually joined myself in September of last year. I had this open request on my conscience for way too long and I am glad that I got this off my head now. I also hope that Mad Max will like the NFO file logo. I have to admit, that I got a little bit rusty (old maybe? ). I also Finished Something Else 😉 !!! I wrote about the amount (count) of different SAC releases across all pages earlier this year.?? 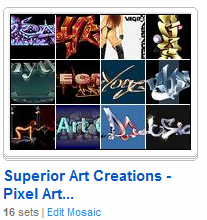 I also made stuff available for download in re-sorted and grouped bundles by content type rather than by SAC artpack. That was all nice and good, but does not make the old-school art of ASCII, ANSI or Pixel Art accessible (viewable) online and across platforms.?? Okay, so I took it upon myself to convert the thousands of ASCII and ANSI art pieces that several dozen artists produced over a period longer than 10 years and converted all of them into PNG image format, which is compatible with everything today. I also converted the Pixel art that was for a large degree saved in the old IFF (or LBM of Deluxe Paint II) format and other similar depreciated formats, which are today not in use anymore. 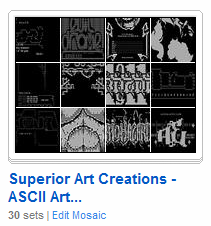 All 3,000+ Superior Art Creations ASCII Art Pieces from 30+ artists and all 35 SAC art packs in one Flickr collection with 30 separate picture sets, sorted by artists most of the time. 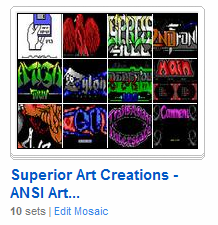 All 450+ Superior Art Creations ANSI Art Pieces from 25+ artists and all 35 SAC art packs in one Flickr collection with 10 separate picture sets, 9 sets for the nine most productive ANSI artists in SAC and a tens set with various ANSI art by 15+ SAC artists who did not produce very much ANSI art for the packs overall. I created by far the most ANSI art of all (over 130 ANSI art pieces), followed by Rave with 105 pieces. Hetero did 72, Dark Star aka Puschel did 25, Raiser 24, Shot and Kenet 18 ANSI’s each, SL aka Strike Light 16, Webpige0 12 and 56 ANSI art pieces created by over 15 different artists. I already uploaded most of the 400+ tracker music files converted to MP3 to my Amazon S3 Account. I need to check and then upload if I missed any song and then think up a way to put them up somewhere for easy accessibility and play-back capabilities via web browser, without too long load-times or requirement for setting up another browser plug-in, which would have to be downloaded first. All this should of course take as little as time as possible, without sacrificing the accessibility of the music by platform restrictions. Ideas and suggestions are welcome and appreciated. Whatever the suggestion might be, it has to run on MS IIS6 on Microsoft Windows 2003 Server, Classic ASP and/or ASP.NET and/or PHP 4. If it requires MySQL 5 and/or MS SQL Server 2005 portable or developer edition, fine. Also MS Access 2007 as database storage for some settings and catalog content would be alright. Hi! I was looking around for old-school ANSI art and stumbled across your site. Wow, this brings back good memories of the old BBS days! Thanks for preserving your art on Flickr and so forth. I was trying to download the art packs from your site, but I get a 404 error…just a heads’ up. Anyway, I’m off to look at your Flickr gallery. Cheers! argh… IT changed something in the web server configuration yesterday. None of the file downloads and also the ansi and ascii galleries did not work because of that. I got it fixed and you now should be able to download the packs etc. I hope that I got everything back to working again. Please let me know, if you come across something that does not work or does not look right. Sorry for the trouble this caused for you. might be useful to you.. SO I FIGURED I WOULD COMMENT AND RESPOND TO CREDIT YOUR DEDICATION. I AM ONE OF THE SAME.. NICE TO MEET YOU..